We also supply oil pumps for LDO, Diesel Kerosine Applications etc. Thermax boiler burner nozzle, Thermax boiler bergonzo nozzle, Thermax boiler bypass nozzle assembly, Thermax boiler ignition electrode, Thermax boiler ignition transformer, Thermax boiler diffuser plate assembly, Thermax boiler sequence controller, Thermax boiler programmer, Thermax boiler combistat, Thermax boiler temperature controller, Thermax boiler PT100 sensor, Thermax boiler Wagman cone, Thermax boiler nozzle holder, Thermax boiler electrode holder, Thermax boiler photocell, Thermax boiler photo resistor, Thermax boiler u.v.cell, Thermax boiler gauge glass, Thermax boiler mobrey switch, Thermax boiler monal float, Thermax boiler magnet with rod, Thermax boiler nozzle rod, Thermax boiler burner rod assembly. We offer quality range of flame sensors of Peercem,ECEE France for oil burner & gas burners. 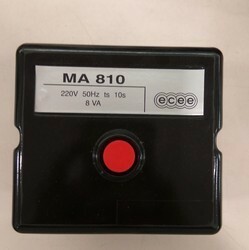 8205: 8205 photocells to be use with Petercem burner control model MA 810, MA150. 8209: 8209 photocell to be use with Petercem burner control model MA55. 8300: 8300 is u v detector which has to be use with Petercem gas burner controller model GU 336.